MORE DSP Layout today! This is the Pool Party paper from the Soft Subtles 6X6" Designer Series Paper Pack #146966 paired with the Well Written Framelits Dies #148534. The base card is Night of Navy color. You just can't beat polka dots and stripes!! CLASSIC for sure! In case you missed the layout yesterday, here it is again. TRY IT! Here is fun way to use those designer paper scraps I know you have!! I die cut a heart using BE MINE STITCHED FRAMELITS DIES #148527. Using ALL MY LOVE DESIGNER SERIES PAPER #148576, I cut my scraps into 1/2" strips and attached them on the back of the die cut. SIMPLE! The result is a sweet scrappy quilt look!! Try it!! Shop here during Sale-A-Bration to earn FREE items! This will KNOCK YOUR SOCKS OFF!! It's such a FUN card created like the old woven potholders you might have made as a kid!! 1- Cut a window for weaving using the NEW Rectangle Stitched Framelits #148551. This is my Big Shot sandwich of dies for ONE pass thru the Big Shot Die Cutting Machine #143263. 7- Works with ribbons, also!! TRY IT!! I used the Grapefruit Grove & Lovely Lipstick Foil Sheets #149712, which is a FREE item with a $50 purchase (usa) during the 2019 Sale-A-Bration Promo!! The pack has EIGHT sheets of 12X12" Foils. It's time for THANK YOU cards!! This is a challenge I received from #DeniseWaddell, my Team Leader from California. Denise sent me an envelope with pieces of the adorable ALL MY LOVE Designer Sereis Paper#148576 from the upcoming 2019 Occasions Catalog. Directions: make a card and post it! I needed a Thank You card for a new customer so paired the designer paper with the THANK YOU THINLITS #146832! Perfect! I love petite print papers because they are easier to use than big splashy designs. I hope this makes the recipient SMILE!! GET READY!! 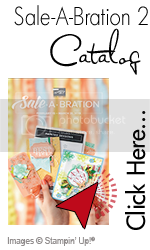 The 2019 Occasions Catalog and Sale-A-Bration Promo begin Jan. 3rd!! It's the BEST time of year! Sale-A-Bration Promo starts Jan. 3, 2019!! It's the BIGGEST PROMO of the Stampin' Up! year!! HELLO CUPCAKE Stamp Set is a FREE item with qualifying purchase during this AWESOME EVENT! GET READY!! When a friend needs a long-distance hug, send a special card you made! This detailed look was created with the LACE DYNAMIC TEXTURED IMPRESSIONS EMBOSSING FOLDER #148530 coming Jan . 3rd in the NEW 2019 Occasions Catalog! Before embossing, I dragged the Sea Form Ink Pad across the inside of the folder to add soft color in the impressions! The base card is Sea Foam with a layer of Basic Grey. Send a card to someone who needs a hug! The cheerful colors of these flowers grabbed my eye on this swap card made by Dawn Miller. The Beautiful Promenade Bundle #148389 flower colors are NEW Gorgeous Grape, Melon Mambo, and Pumpkin Pie! GREAT combo for a happy feeling! These flower are a TWO - STEP design: two images are stamped to create all the detail! Lovely card, Dawn. Thanks for swapping with me! This swap was made by Elizabeth Barnes of Canada. It's has a lovely softness by combining NEW Balmy Blue and NEW Gray Granite. The Foliage Frame Framelits #146353 in the Gray Granite color add LOTS of texture to the circular design. Very sweet, professional looking creation, Elizabeth! Glad we swapped! I'm so sorry I've be unable to blog!! My new laptop got hung up at the Geek Squad for my data transfer!! This is a clever swap card by Kathy Van Helsland. Half of the front opens for your message. Here is the inside. The red card stock measures 8-1/2 X 3-1/4" scored at 4-1/4". This is an easy layout, but very unique! Are your Christmas cards in the mail yet?? Half of mine have been sent! Such a cute Birthday card for anyone!! This is a swap, sadly without a name. This perfect paper is Broadway Bound Specialty Designer Series Paper #146277. BEGINS DEC. 5TH WHILE SUPPLIES LAST!! Kathy Johnson of Forest Hill, MD is the creator of this crisp, pretty swap card! It features Serene Garden Bundle of 8 stamps and 6 dies #148395. Kathy used Stampin' Blends Alcohol Markers for the color. Very nice, Kathy! This is a nice, simple holiday card I received as a swap, but don't have a name to give credit. This stamp set is the versatile Sheltering Tree #137163. Wink of Stella #141897 adds frosty shimmer to the wintery tree! Lovely! As promised, more of my favorite OnStage swaps from last week. This unique layout caught my eye! Jo Ann Harris created this card using Peaceful Poinsettia Bundle #149962, New Blackberry Bliss Cardstock and Blends Markers. The images are heat embossed with Silver and this poinsettia is shimmered with Wink of Stella #141897. Here is a DELIGHTFUL birthday creation by Jackie O'Bryan of KS. Black really POPS the colors!! This is the cute Broadway Birthday Bundle #148321. Check out this UNIQUE detail: she ran a circle of Window Sheet #142314 thru the Subtle Embossing Folder # 143706!!! Very interesting texture!! All the color strips are popped out using the Foam Adhesive Strips #141825! This is a HAPPY card for ANYONE's Birthday! Grey and White isn't very exciting. That was my challenge when I offered to help my working daughter with a Baby Shower she is hosting soon. The shower is for TWINS - a boy and a girl. Well, I decided to add lots of texture, shine and glimmer! These are "Table Tents," which are the same on both sides. By adding a "W" of cardstock inside, I insured the tents would not collapse. The cute little critters are from A WILD THING Stamp Set #144344. The Teeny Tiny bows are from the FARMHOUSE FRAMELITS DIES #147922 and cut six bows at once. This TWINS Banner will hang on a white tablecloth on the food table. Mini canning jars with cute critters and vellum "grass" are accents for the food table. I attached the critters to floral wire and added a die cut tree from the same FARMHOUSE FRAMELITS DIES. So how did I do with a challenge of grey and white?? Your stamps are so versatile so use them beyond greeting cards! Eliminate the Christmas tree in the back of the truck to create a MASCULINE Birthday Card!! Increase the versatility of this Farmhouse Christmas Bundle #147922. The sentiment is from the Darling Label Punch Box #146855. REMEMBER the men in your life with a special "guy card!" $AVE 10% on this lovely Botanical Bliss Bundle #148332 wood or #148333 clear. I love pink and gray together - so soft! These colors are Smoky Slate and Blushing Bride. This card features the NEW Mango Melody and Basic Gray. Love this pretty die cut rose!! Here is a FUN, breezy summer card!! The image is from a NEW stamp set called, ONE FOR ALL #146652 wood OR #146655 clear. The background is Brights Stampin' Write Markers #147157 on Glossy Cardstock #144240. This shot shows the Glossy Paper. The marker colors are Poppy Parade, Melon Mambo, Flirty Flamingo, Mango Melody and Daffodil Delight. The markers blend very well on the glossy surface! Try it!! Accented Blooms Stamp Set # 146678 wood OR # 146681 clear, has a coordinating punch called Tailored Tag # 145667! This set pairs perfectly with Stampin' Blends, alcohol markers!! Note how the lower flowers have a soft shadow of Light Crumb Cake Blends. The base card is embossed with the NEW Subtle Embossing Folder # 143706 that gives a "linen look!" On this card I did a Resist Technique for the sentiment. I stamped the sentiment in Versamark Ink and heat embossed it using Clear Embossing Powder. Next, I used the Old Olive Blends Marker to write over the "hello" which had no clear embossing on the letters. I highly recommend this lovely Accented Blooms and Tailored Tag Punch for your collection! ALL Stampin' BLENDS are in stock now so get them while you can! You will love them - I do!! There is nothing better than playing with NEW stamps!! I love to pull out a "suite" of products and just start creating. This card really shows off the Garden Impressions 6X6" Designer Series Paper #146289 that coordinates with this Abstract Impression Bundle, #148348! This gorgeous butterfly die is part of the Bundle. Bundled products save you 10%! The wing tips are not attached and slightly curved up to show a "peekaboo" of the designer paper! This unique corner die is cut from the same designer paper as the envelope flap. There is ENDLESS versatility when you purchase an entire "suite" of products that the professional artists have designed to coordinate!! These similar cards were created with the Stamparatus positioner, using the "Hinge Step" method. The Stamparatus #146276 is now available!! After stamping the leaves, I cut around them on one side. The leaves are all "splattered" with Stampin' Write Markers. This base card is Mint Macaron with a Tranquil Tide die cut "Happy Birthday," #143700. This base card is soft Sea Foam with a Gold Foil sentiment. This base card is Mint Macaron with a Silver Foil die cut "Happy Birthday." These designs are gender neutral and created with the NEW versatile Rooted in Nature Stamp Set of 16 images, #146479 wood OR #146482 clear. This is SOOO amazing! Get MORE from your current dies by adding the NEW Big Shot Embossing Mats #146327! Sneak Peek into next week's NEW 2018-19 Annual Catalog!! I cannot get enough of this gnarled pine tree! This is the AWESOME new Rooted in Nature BUNDLE of 16 images and 12 dies #148352 in wood, or #148353 in clear mount. I used the "Masking Tape Technique:" press a low adhesive tape (like painter's tape) onto your ink pad to pick up color, then press the tape onto your cardstock to transfer the color. SO EASY! The coordinating Nature's Poem Designer Series Paper #146338 makes perfect wrapping paper for smaller gifts! Click this picture to get a larger view of this lovely detailed leaf print. This bundle will be a top-seller! It is available beginning June 1, 2018. A WINNER, for sure. To create realistic sunglasses for a handmade card, I started with Pocketful of Sunshine Bundle #145345. Stamp the sunglass image two times: once on the color of cardstock for the eyeglass frame and once on Silver Foil Paper #132178. Die Cut the eyeglass frame. Hand cut the lens only from the Silver Foil Paper. Layer. EASY! It's so cute to have a fancy pocket to show off your Rhinestone embellished sunglasses!! Pocketful of Sunshine BUNDLE $AVES you 10% when purchased by May 31th!! Did you notice the "Pick A Pattern" Washi Tape #144166 made the pocket more FUN?? Eastern Beauty Bundle #145308 has hundreds of layering options - it's so fun to play! This is a neat color combo of Night of Navy, Lemon Lime Twist and a touch of Old Old! May 31st is your last chance to purchase these products at a BUNDLED discount of 10%. Sometimes you want to create something soft and special. I really like the look of this simple sponging technique! I used the DEBOSSED side of the Lovely Floral Dynamic Embossing Folder that is part of the May 2018 Early Release Promo. I prefer Sponge Daubers #133773, but you can also use Stampin' Sponges #141337. Pounce the dauber on a ink pad to collect ink. Then gently rub onto the image. It's very easy because it is "inexact." Rubbing lightly is best - you can always add more color if desired. The sentiment is stamped in Soft Suede ink instead of a bold black ink. Try this simple coloring trick! A GLOSSY greeting for someone special! Cut 2-3 sentiments using the Happy Birthday Thinlits #143700. Stack them exactly on top of each other with adhesive. Simply heat emboss the greeting two times, using Versamark ink pad and CLEAR embossing powder. A tweezers is very helpful. Attach to your card. This angle really shows the SHINE!! The sentiment seems to jump off the paper! This is a sweetly simple card! These charming little flowers are from the Early Release May 2018 Promo. The color is Calypso Coral. Note the dry embossed image peeking out under the layer! It's the Lovely Floral Dynamic Textured Embossing Folder! Another new item in the May Promo! YOU can purchase these BRAND NEW products NOW, plus the NEW 2018-20 In Color ink pads! !